Green, very green. The Monteverde Cloud Forest Reserve is rich with life —animal and plant. This high-elevation forest is blanketed by persistant canopy-level clouds that helps maintain moisture to create an incredible array of flora. By the time the warm winds of the Atlantic rise, condense and reach Santa Elena, they provide a moisture-rich lid over this high terrain. This environmnent creates competition for growth space and plants are seen growing on existing plants. Get ready to hike. The skywalk or canopy tours are a great way to see the cloud forest. Numerous walking bridges offer a view from above. The hiking trails below are also sure to delight and guided tours are available. Selvatura Canopy and Bridge Tours - platforms are fastened to the trees and the zip lines are within the canopy (not above it). Sky Trek - has longer landing platforms, lines above the canopy and personnel will slow your approach. Get your birding on! 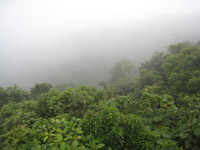 Monteverde Cloud Forest is a great place for bird watching. Quetzals, hummingbirds, three-wattled bellbirds, keel-billed toucans, chestnut-headed oropendolas, Bananaquits, Bare-necked umbrella birds, Long-tailed Manakins and Violet sabrewings just to name a few. There are so many unique species of mammals, it'll be hard for you to name them all. See Jaguarundi, Margay, Three-toed sloths, Kinkajou, Agouti, Ocelot, Olingo, Paca, Howler monkey, Collared peccary and Baird's tapir. You'll probably set up camp (find a hotel) in the town of Santa Elena that was founded by the Quakers in 1951. Here's there is plenty of lodging, restaurants and its own cheese factory. Enjoy ice cream on the streets and find plenty of touring companies to help you get the most of your stay.